I had a pretty bad experience when I first played the new SimCity. It all started late Tuesday night after I got back from a particularly long and stressful day. I heard tales of how no one could activate their game, and some stories of people not even able to access the game itself because of the game’s always-online DRM model. I put all those stories out of my head and began installing the game. Not too long after that, I hit the big, fat play button on the main menu and attempted to access the servers. No dice. I tried on and off for the next few days, but always hit this invisible wall where I couldn’t access the servers. I couldn’t play my cool new game and I was kind of upset. But, again, I pushed all that out of my mind and on Thursday night (two days after the game’s official launch) I was finally able to play SimCity. I fumbled through the beginning of the tutorial and right when I was starting to have fun the game crashed. I quickly restarted and was, again, able to access the servers just fine and play the game proper — just without a tutorial this time. I was invited to join a region with Evan. 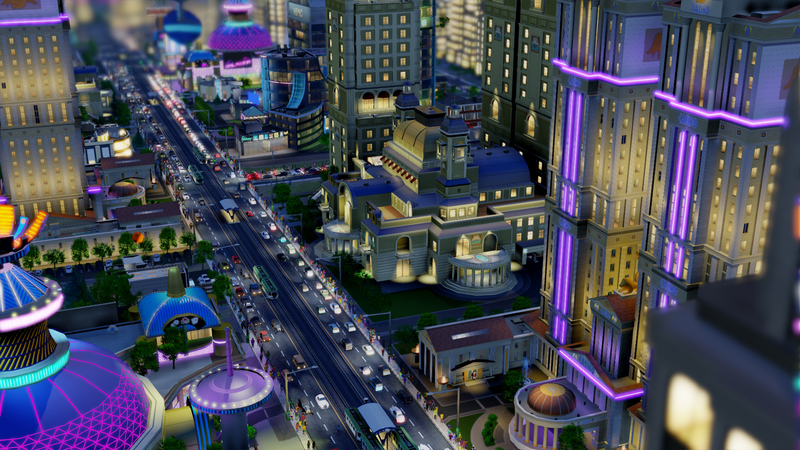 Regions are SimCity‘s way of allowing players to work together in sort of asynchronous multiplayer where resources are shared across multiple cities. I wanted to be a highly industrial city, while Evan wanted to create a quant little suburb with a large shopping district. But things didn’t really work out that way. In actuality, Evan and I just ended up making our own separate cities with residential, commercial, and industrial districts all our own, without much in the way of shared resources. This is because you need to work together in order to make all the cities in a region prosper — and let’s face it, Evan and I aren’t much of team players. We didn’t work together to pool our money into building a great work, one of the new features in SimCity which allows a region of players to work together to build one gigantic super structure that offers a big boon to all cities involved in the project. When I build a city, I want it to be all things to all people. I want a sprawling, gigantic city densely populated and highly efficient. But, this new SimCity forces me to an uncomfortably small plot of land and no way to grow past it. There is no terraforming tool to allow me to shape the terrain to make it easier to develop on. Sometimes, if you place a building or structure, the land will terraform around it, but it doesn’t work well enough with the crazy environments. This means I have to shape my already small city in a way that conforms around places where no person in their right mind would really place a city. I’m talking giant cliffs that you can’t build roads on because they’re too steep and areas with ocean fronts that take up a sizable chunk of land space (and there’s so much open land just beyond the forced boundary lines!). All of it combines to make an incredibly claustrophobic city that I can’t shape the way I’d like. But SimCity does so many things so well that it just makes the few things I dislike about the game so much more prevalent. Building a city has never been easier, all you need is to make some roads. Roads are the groundwork for how everything operates, including electricity, water, and sewage. You don’t need to lay down any pipes, for as long as all your roads are connected to each other — and provided you have enough supply for the citizens’ demand — everything happens automatically. The same goes for zoning; you lay down road and just map which parts of your city you want to be residential commercial, or industrial. Simple, easy, intuitive, fun. Here is where I came across another issue with my first city. The road tool is the main tool by which your city functions, which means you have to properly layout your city to get the most out of it. Higher density roads allow for larger buildings to develop later down the road — if you have a layout that allows for the buildings to grow, thus the addition of a dotted line that serves as a guide for laying down roads. However, these guides led me astray (mainly because there were three different dotted lines going in the same direction and the game didn’t seem to know where I should actually place my roads) and I built roads that were too narrow for massive development. I wanted to specialize in oil because of the very large oil deposit in my city, so I did all the work to develop an oil platform. I pumped a bunch of oil, too much in fact, and the place closed down. Turns out, I didn’t have any place to ship out all my oil since I didn’t have a neighboring city or a great work to send it all. There’s no global buyout that will give me money for my products, I have to put them to use somehow. Which then becomes a major economical problem, my city loses money and I can’t do anything about it. Since that’s the focus of this new SimCity, working in a multiplayer fashion, I don’t know if I trust the internet to help me. I’d much rather have a private region, build multiple cities that trade between each other, and deal with the problem that way. Which is totally viable and something I’m actually doing right now. I’ve developed a new region where I have three cities, each one focusing on a specific aspect of building one full city. It’s not the perfect solution, but the only one that allows me to play more in the way that I would like. Once I got past the server problems and the learning curve of development, I throughly enjoyed playing SimCity. I just got lost in the act of building, restructuring, and Sim-ing the likes I haven’t done in years — probably since SimCity 2000. There is a really fun game in here, however the main issues of small city sizes, no proper terraforming tools, and the reliance on other surrounding cities makes me not really want to play much more SimCity. But I will play more of it, because once I got lost in the gameplay cycle I had a lot of fun. I won’t like most of it, but I’ll play more of it. I just hope it gets better later on. 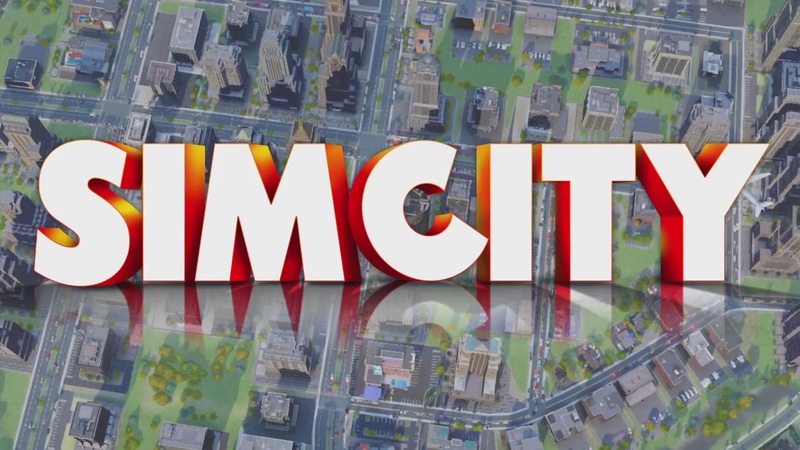 SimCity initially looks and feels like exactly what I’d what from a new installment in the storied franchise. It makes a number of smart additions, mainly through interface, and more elegant versions of everything from a road building tool, to routing water and electricity. In a practically textbook case of diminishing returns, I find that the longer I play, and the deeper I dig, the less fun I’m having. Why? The biggest issue is the plot size, which is insultingly tiny for even a modest world-builder. The lack of a terraforming tool is also discouraging, as is the game’s insistance on multiplayer-based micromanagement at the cost of single-player focused macromanagement. My attempts at devising a quaint, sleepy small town (a direct response to the game’s restrictive borders) were obliterated in favor of perpendicular roads and aesthetically uninteresting zones. Will this game appeal to the other type of player, who thrives on efficiency and is uninterested in breadth or expansiveness? I can’t really say. All I know is that from my perspective, SimCity is a book most favorably judged by its cover.